I looked down at the clumps of stringy ocean plants, speckled rhythmically along the smooth sandy beach. What an abundance of beautiful art all around me, I thought. Suddenly, one particular clump caught my eye – it was a large mound with a curved tail coming off of it, in the shape of a spiral! Inspiration struck and I set to work immediately, gathering up more plant clusters and laying them down to continue the spiral. Once the initial green shape had taken form, the next piece to the puzzle emerged. I set out gathering shells of all sorts, many of them reminded me of the rings of Saturn. 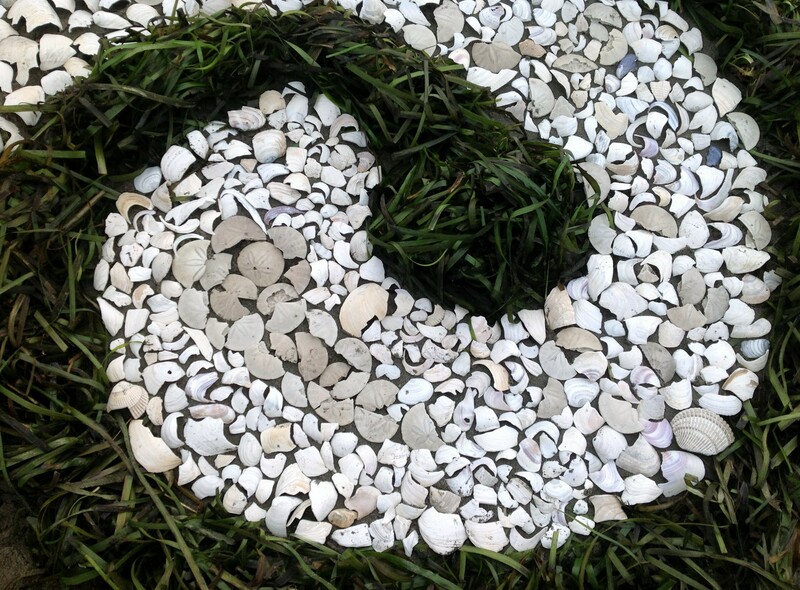 Hands are full, rinse the sand off in the waves, place shells within the spiral. Walk around collecting, kneel down for placing. Back and forth I went, feeling the rising tide behind me, not knowing when it was to arrive. Part of me is resistant to the idea of filling the entire spiral in, the tiny shells take a while to cover the sand and what if the tide reaches me before I am done? A reminder of the inspiration from Andy Goldsworthy and I knew that my commitment was to the process, not the final result – keep at it. An incredible experience emerges as I connect with many pieces of the land I am walking on. 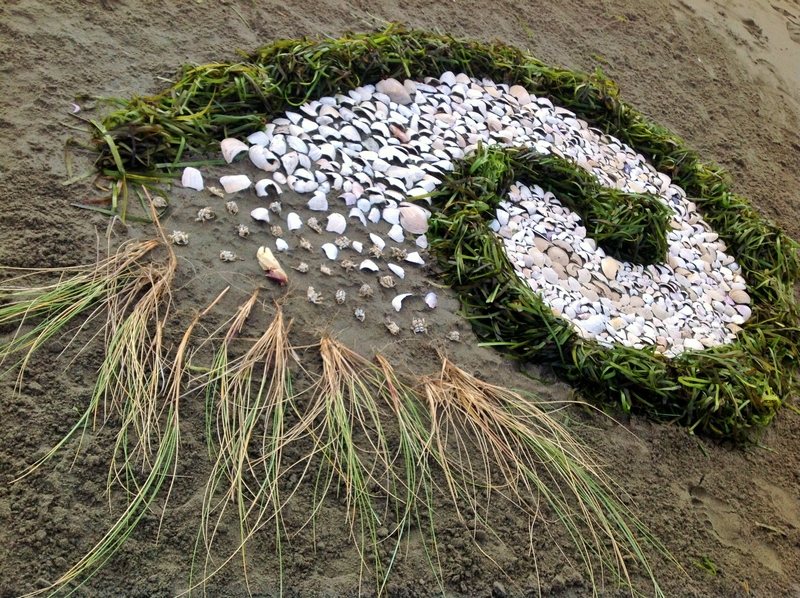 The sand, the shells, the plants, the birds, the water, the crabs – all connected in this spiral of life. Pieces of my Self. My walking shifts to a run with the feeling of the tide rising closer. I noticed an abundance of crab bodies, picked clean by the birds, that became the next emergent form from the spiral in the sand. Working my feet into the sand surrounding the piece, I flatten out the bumps and kick sand inward to create a shading effect encircling the spiral. A desire to photograph the piece hits me, and not knowing how long I had before the ocean received its gift, I run back to my camper to get a camera. Like every day for the past eight, the sky was completely clouded over and a light fog filled the air. 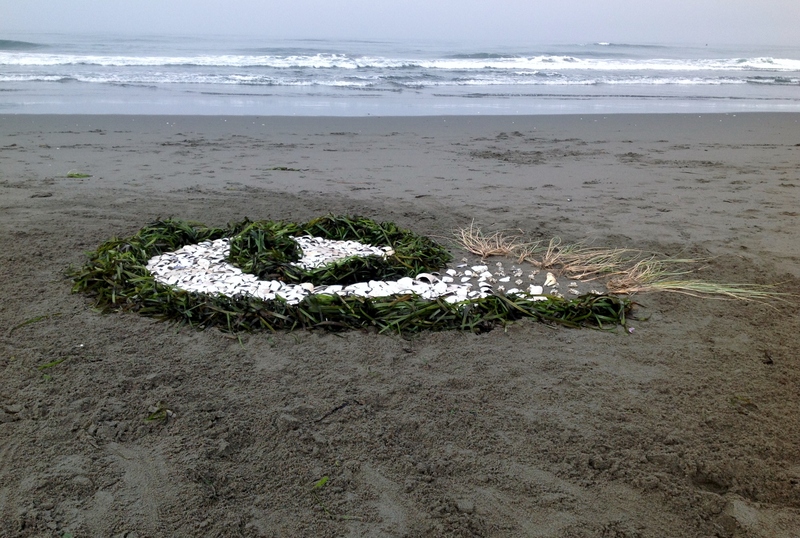 Not ideal lighting for pictures, but worth the effort to get the camera before the tide swallows the spiral. Walking through the dunes on the return to the beach, I grab a few clumps of grass to be the final spiral giver. As I walk back up to the piece, the unthinkable happens as the clouds begin to part, letting the sunlight flow through! I have a shadow! This incredible gift unfolds more completely as I place the grass and take pictures of the creation. Feeling the full shine of direct sun rays on my face, and seeing the blue hues of the sky for the first time in eight days immediately brings tears to my eyes and I bow my head in gratitude for this most beautiful gift. I laid out on the sand and began to stretch my legs. 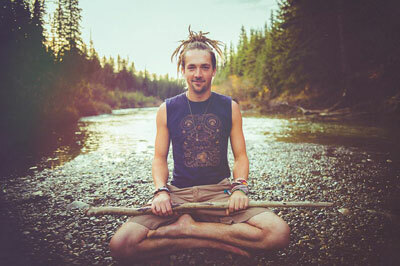 I then moved into my daily sun salutations – a ritual I now realize is more a show of gratitude to Father Sun than it is a practice for my body. I sat down to meditate the tide higher to fully receive the gift I had helped to co-create. After some time, I notice that the tide is not getting any closer than three meters to the spiral. Oh well, I guess it will be another tide’s gift. As I packed up my things to walk back to my camper the clouds sealed up the gap they had created, and the sun disappeared behind once again. Sitting here in the evening writing this, the clouds have since remained, unbroken. A lesson in the joys of giving thanks back to the land. The spiral gift was received and the thanks of warmth from the sun filled me with a love and lightness I had forgotten. For those interested in some naturally beautiful and artistic inspiration, you can find the documentary “Rivers and Tides” on Youtube – featuring Andy Goldsworthy’s creations and incredibly insightful wisdom. More of his work and story can be found online. Thank you for the inspiration! Heartfelt Sigh* thank you so much for sharing your story. It really really really brought much light and inspiration into my night…I’m looking forward to reading more of your writing. Gracias !! Aloha!